Her teammates call her “Iron Faye” Farrales, which conjures up an image of a steely, stone-hearted, cold individual. Watching her on the mats, it seems suitable, but as she climbs the stairs to the locker room, she’s anything but. She has dimples in her cheeks when she smiles, which is quite often, and a laugh that could be heard from the other side of the room. She cheerfully acknowledges her teammates and coaches as she walks by, even after drilling for more than 2 hours and being drenched in other people’s sweat. So, where does “Iron” come from? Almost serendipitously, because of a chemistry pun. Just like a scientist, Faye is technical, focused, and determined. Her nickname comes from “Fe” for Iron, and the shirts and hashtags grew from there. The little details are what’s most important to her, so much so that herself as a person isn’t what matters. It’s everyone else that is significant to her. “I have a lot of people that I look up to, but many of them are my teammates,” Farrales says. A purple belt in JiuJitsu at Renzo Gracie Academy, she has been training there for the last five years. Her journey in martial arts originally began at a boxing gym, where she worked. She was invited to a Renzo Gracie seminar by his students that frequented her gym, and the rest was history. Renzo himself watched her during the seminar and called her a natural. She immediately signed up, but began training Muay Thai first. However, her attraction to BJJ won her over and she decided to focus on that instead. As Faye talks, she often brings the conversation back to her mentors or teammates. It’s not that she’s uncomfortable with speaking about herself, but makes it clear that she doesn’t think she would be where she is today without them. 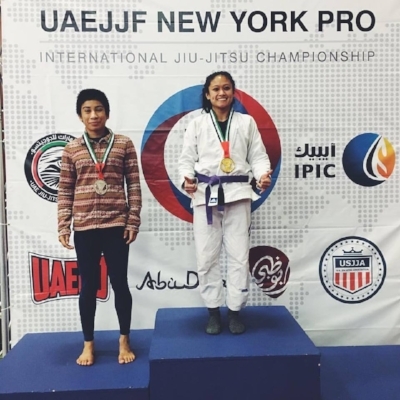 Brazilian JiuJitsu has been a huge part of Farrales’ journey in New York. She started training almost immediately after moving to the Big Apple from Seattle, and it has shaped much of her perspective. The busy athlete maintains a packed schedule with work and training clients, but squeezing in the sport is the most enjoyable challenge of her day. Farrales manages her time by creating a schedule that allows her to work on different things every session. Some practices are just to roll and be loose, while others are particular drills with specific individuals. While competing is her passion, the ultimate and concrete goal is to obtain her black belt. The health and fitness advocate ultimately would like to create a program that can provide JiuJitsu in communities that are underprivileged. A firm believer in nutrition and well-being as a priority for all people, she is certain that by teaching that to kids when they are young, they will grow up understanding the value of what they eat and do. While Faye puts together her master plans, she looks to one very important person for advice: Mushin MMA owner and founder Erik Owings. The former MMA fighter and trainer to Georges St-Pierre is also Farrales’ boss and mentor. Farrales credits Owings to helping her develop her JiuJitsu game, as well as her training partners at RGA. Her academy family has seen the transition in Faye as she has become more confident both on and off the mats. A regular competitor, she has competed all over the world and engaged in 2 superfights. Most recently, she won her last superfight as well as gold at the UAEJJF New York Pro in her weight class. JiuJitsu isn’t the only thing that keeps her occupied. She also completed the United Airlines half-marathon and is the project manager of A Love Squad, a fitness and sports lifestyle brand. Farrales’ is also relaunching her website, The Good Chief Co., which provided advice and insight from her own life. On top of everything she’s accomplished, she has also become an Adidas Combat Sport Athlete. Sponsored by the Three-Stripe Army, Farrales joins the likes of Heather Hardy and Hannah Bronfman as ambassadors. What has the journey been like for her as she has seen her life completely transformed by the “Gentle Art”?